Getting a parcel from one side of the Queen City to the other isn’t rocket science. If your courier service makes you wonder what’s taking so long, maybe it’s time for a change. We are a fast and reliable courier service dedicated to delivering your packages in an efficient manner. 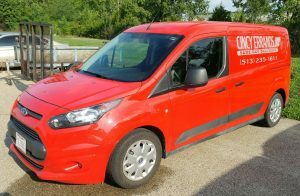 Call 513-235-1611 for Cincinnati courier service in Ohio, Kentucky or Indiana. We needed a courier and needed one right now... I made a few calls and everyone required an account and setup... I didn't have time for that. Cincy Errands was exactly what we needed. Sandi took charge and we were taken care of in less than 1.5 hours. Great customer service and follow up. First time using them, and made me feel like it was a lifelong partnership. Also worth mentioning is that the courier was professional looking, and courteous. Shirt tucked in, made small talk etc. Again, hats off!! Great Service!! We ran into a giant snag bringing a large piece of equipment to a trade show from Columbus OH to Cincinnati OH. The last day of setup and we still did not have our product in the booth. I made a call to Cincy Errands and within a couple hours they were picking up the freight and taking to the show. Not only were they fast and extremely sensitive to our plight, they charged us a very fair price for a last minute service to a convention center.